Firefox helped make the Web more awesome in 2011. We released Firefox 4 with Sync to hundreds of millions of people worldwide; we launched Firefox for Android; added the new Firefox Aurora development channel; adopted a faster release cycle; and introduced Do Not Track to the industry. 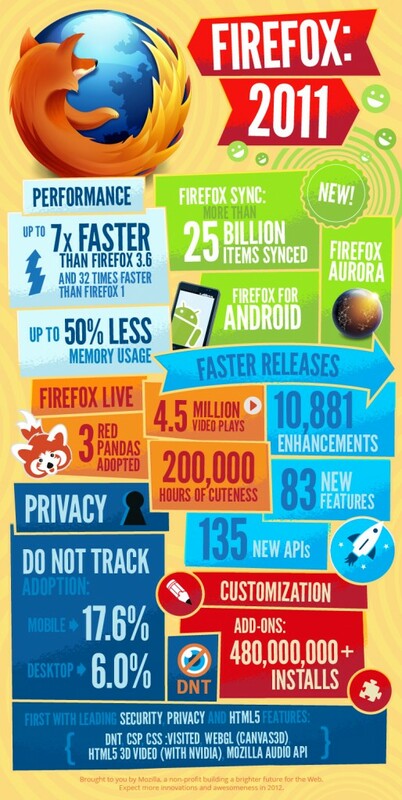 Now we’re excited to share some of the highlights of Firefox this year in facts, figures and pictures. It’s all part of our commitment to innovating on behalf of people everywhere and continuing to build a brighter future for the Web — in 2012 and beyond.